Yesterday I found this extremely powerful video about how the sun sees your skin and thought it was important to share. In the past year, I've realized how important it is to take care of your skin, especially your face. (If only my 18 year old tanning obsessed self knew that….) Your skin is so sensitive to UV rays and it's best to wear sunscreen every single day. Even in the winter, rainy days, or when you least expect it! But if you're like me, the idea of wearing sunscreen everyday is no bueno. Thankfully, the good people of the world have made moisturizers with SPF in them. I have sensitive skin so when I'm putting something on my face everyday I need to make sure that it won't clog my pores or cause me to break out in any rash. 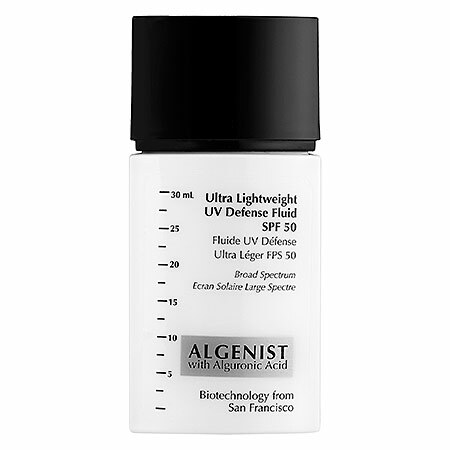 After searching around, I found (and swear by) this Algenist UV Fluid. It's super lightweight (as you can tell by the name) and goes on great. I've been using it every day for the past three months and it hasn't bothered my skin at all. What I also really like about it is that my makeup stays better when it's on. I put it on every morning after I wash my face and I'm good for the day! A little drop goes a long way too. I'm still on my first bottle. Other good moisturizers are Shiseido (I always trust their products) -- here is an oil-free one, and Laura Mercier (a high quality line!). There are also some great tinted SPF creams like Estee Lauder and Clarins if you wanted to switch out your foundation. And for those on-the-go people, there is also a spray and brush you can keep in your purse or just have around if you forget! Just make sure when you're searching for products to always get something between a 30-50 SPF so you know you're covered. (Anything over 50 is usually a sham).